With a view toward promoting dialogue across the Atlantic, the American Council on Germany aims to engage officials, business leaders, journalists, and other experts to gain a better understanding of the political, economic, social, and environmental landscape of the two countries. The ACG’s Leadership Mission on Urban Affairs and Sustainability brings together local government officials to meet with their transatlantic counterparts in order to gain a better understanding of issues faced by cities and policy solutions, giving participants an up-close look at city management and government administration across the Atlantic. Building on its history of conducting Study Tours and other programs that give participants a chance to exchange best practices, the ACG restructured and redesigned its McCloy Fellowship in Urban Affairs as a Leadership Mission to have a greater impact. The goal of the Leadership Mission is to give participants access to their professional counterparts on the other side of the Atlantic and to engage in dialogue on the varied challenges facing cities today. From immigration and integration to race relations and education to sustainability and smart cities, the inaugural group, which traveled from September 18 to 30, 2016, learned how three sets of U.S. communities are planning for the future: Alexandria and Arlington, Virginia; Charlotte, North Carolina; and Pittsburgh. The German cohort consisted of: Christian Campe, Head of the Law Department and Head of the Culture Division for the City of Hameln; Tobias David, Personal Consultant/Assistant to the Lord Mayor of Leipzig; Esther Keller, Deputy Head of the Division for International Relations at the Mayor’s Office in Berlin; Silvia Kistner, Official in Land Use Management for the City of Karlsruhe; Matthias Krebs, Manager of Strategic City Development in the City of Mannheim; and Nadja Taube, Energy Manager at the Department of Facility Management for the City of Düsseldorf. The group had the opportunity to meet with individuals who understand the importance of exchanging best practices. The strong network of Warburg Chapters and ACG alumni in each city made it possible to put together a very strong two-week program of meetings, discussions, and site visits. The participants arrived in Charlotte just days before a police shooting and subsequent protest and rioting. This led to some changes in their scheduled meetings but also provided them with some additional insights into race relations in America. Their host was Scott Denham (1995 ACG Young Leader), Charles A. Dana Professor of German at Davidson College, who arranged meetings with a range of interlocutors in Charlotte. Their visit focused on how major cities are dealing with demographic issues. The participants said the highlight of their visit was the time they spent at a soup kitchen to learn how nongovernmental organizations help fill the gaps governments do not reach. The group continued on to Pittsburgh, a city they referred to as “a city of transformation.” Here, the meetings and site visits focused on sustainability and rebuilding for the future. 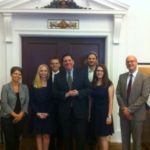 They had the opportunity to meet with officials from the Green Building Alliance, the Pennsylvania Environmental Council, Sustainable Pittsburgh, and the Allegheny Conference on Community Development, among others. Carving out some time from his day, the Mayor of Pittsburgh, Bill Peduto, also met with the group. Their journey ended in the Washington, DC, area with meetings in Arlington, Alexandria, and Washington itself. Dale Medearis (1995 McCloy Fellow), Greater Washington Warburg Chapter Director and Senior Environmental Planner at the Northern Virginia Regional Commission, arranged for the cohort to meet with city planners in Arlington and Alexandria. The two cities are now both wrestling with how to make their cities more sustainable but also how to attract younger generations. In Washington, they met with staffers from City Hall who manage communication and community engagement. Much of the discussion within Washington focused on trust building between low-income communities and government officials through unique outreach programs. During a debriefing with ACG President Dr. Steven E. Sokol and Francis Kelly (1996 Young Leader), an ACG Board member and Managing Director and Global Coordinator of Public Affairs at Deutsche Bank, the group discussed the changing political landscape of America, the importance of the German-American relationship both now and in the future, and the U.S. Presidential election. Though the Leadership Mission provided only a snapshot of the country, the visits to three very different urban areas gave the group a deeper, more nuanced look at American society and the challenges cities are addressing. The participants said they will return home with new ideas about how to tackle some of the same challenges, and that they hope to continue the conversations with the people they met along the way. This Leadership Mission was conducted in cooperation with the Deutscher Städtetag (Association of German Cities) and the National League of Cities.